The base of my plot is covered with Autumn-fruiting Raspberries. I don’t know how long ago they were planted, as they creep over about 7 or 8 different plots across that section of the site. Thanks to a family friend, I learnt that Autumn-fruiting raspberries fruit on the current year’s growth, so they need cutting down to ground level after they’ve fruited. 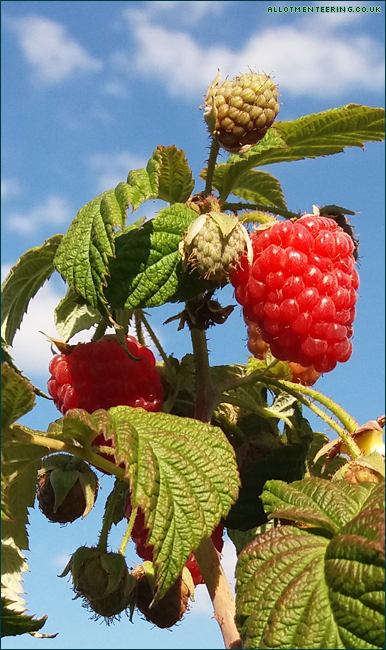 Summer-fruiting raspberries fruit on the previous year’s growth, so they don’t get cut back in the same way. Since then, I’ve cut down the raspberries each winter, and in 2017 and 2018 I also added several bags of manure across the raspberry patch to improve the soil. 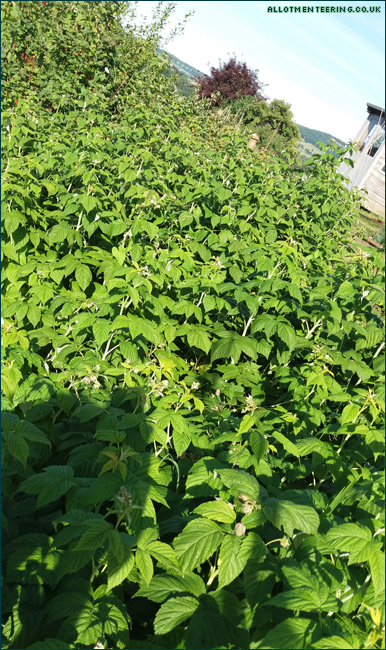 Most of the time that part of the plot is just left to its own devices, so despite the raspberries growing semi-wild, I thought the soil would benefit from a feed. The first year we noticed this, we wondered what on earth we’d done wrong, thinking it must have been a watering problem, or lack of feed! But no, that kind of nasty dried-up edge (which can also look black rather than pale) is a classic sign of Raspberry Beetle. Apparently the beetle can also affect blackberries, although thankfully they don’t seem to have discovered my blackberry bush. 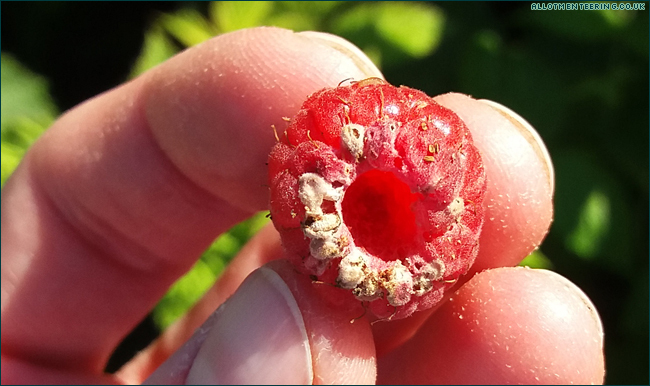 The raspberry beetles lay eggs on the raspberry flowers from May to mid July, but it’s the larvae / grubs that do the damage – they feast on the fruit (causing that dried up look), moving into the middle of the fruit, before dropping into the soil when they’ve eaten enough. They then spend the winter in the soil before starting the whole cycle again in the spring. 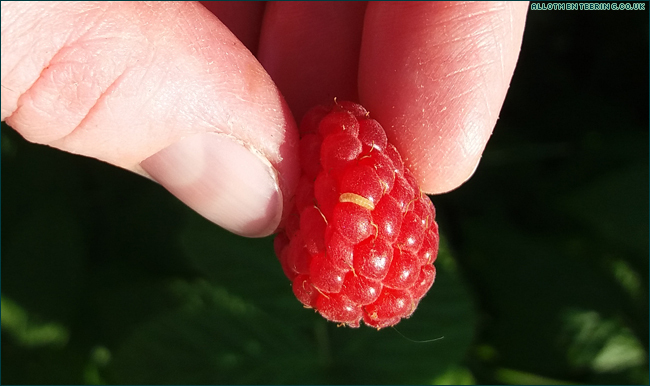 Because of the seasons the grubs are active, they mainly cause a problem for summer raspberries… mine are autumn raspberries, so only the first month of crops are affected – once we get to the second week or so in August, the problem stops until next year. The allotment site isn’t organic, but personally I don’t use chemicals on my plot so any chemical ways of eradicating raspberry beetle are out. I did read a suggestion to “loosen the soil in the autumn so the birds can eat the overwintering larvae” but for my plot that isn’t really ideal. We get plenty of deer and badgers, but the only time I’ve seen birds on the allotment is when a crow wants to drink from the water trough. We tried to be particularly diligent at removing any affected raspberries in 2018. Those berries then went into the garden waste bin, as my compost bin doesn’t get hot enough to kill off any pests (I had mint growing in there one year). I’ll continue to loosen the soil during the winter (you never know, a badger might take a liking to eating those grubs) and get the usual three bags of manure to feed the plants in April in the hope that we can control the beetle population a little better. Have you ever encountered Raspberry Beetle? And if you have, how did you manage to resolve it / work around it?